Our history in the commercial construction business spans decades. 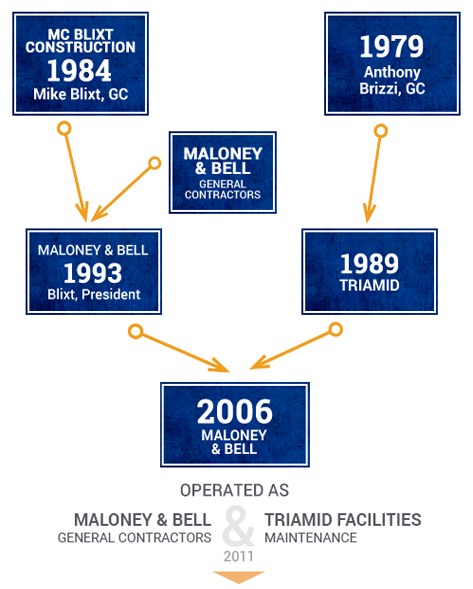 Following ventures as Triamid, MC Blixt Construction, and Maloney & Bell, partners Anthony Brizzi and Mike Blixt formed Triamid Construction of Central California, Inc., incorporated in 2011. Today, Triamid is a certified Service Disabled Veteran Owned Small Business Enterprise, qualifying us to offer services for the State and Federal sectors, as well as the general commercial construction and facilities maintenance markets. Over the course of our combined history in the industry, we have successfully worked with many regional clients to build, improve or maintain their commercial establishments.